April 01, 2012 — The Prostate Cancer Foundation (PCF), Stand Up To Cancer (SU2C) and the American Association for Cancer Research (AACR), SU2C’s scientific partner, announced today the formation of a new Dream Team dedicated to prostate cancer research during a press conference at the AACR Annual Meeting 2012, held in Chicago, Illinois. 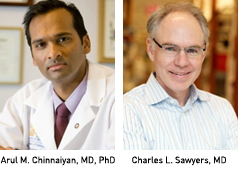 Arul M. Chinnaiyan, MD, PhD, and Charles L. Sawyers, MD, will lead the Dream Team project titled “Precision Therapy for Advanced Prostate Cancer.” The Dream Team scientists are drawn from five leading prostate cancer research centers in New York, Boston, Seattle and London. The SU2C-PCF Dream Team Translational Cancer Research Grant will provide funding of $10 million over a three-year period for a five-center project that will address resistance pathways for hormone refractory prostate cancer with special emphasis on metastatic disease, and deliver near-term patient benefit through investigation by a multidisciplinary, multi-institutional, synergistic Dream Team of expert investigators. Prostate cancer is the second most common cause of death for men in the United States, affecting one in six men, according to the Prostate Cancer Foundation. More than 2 million American men and their families are currently living with prostate cancer, with more than 16 million men affected worldwide. Chinnaiyan, MD, PhD, is a clinical pathologist and investigator at the Howard Hughes Medical Institute, S.P. Hicks endowed professor of pathology and professor of urology at the University of Michigan in Ann Arbor, and an American Cancer Society research professor. He also serves as the inaugural director of the Michigan Center for Translational Pathology. The Chinnaiyan laboratory has focused on functional genomic, proteomic, metabolomics and bioinformatics approaches to study cancer for the purposes of understanding tumor biology, as well as to discover clinical biomarkers. Dr. Chinnaiyan has also been the recipient of PCF career-development funding and research awards since 2001. “Utilizing this grant, we will be able to bring great scientists and great clinicians from around the world to join forces in the fight against metastatic prostate cancer. We hope this unique model of research will lead to patient benefit in the short-term,” said Chinnaiyan. Sawyers, MD, is chair of the Human Oncology and Pathogenesis Program at Memorial Sloan-Kettering Cancer Center in New York, N.Y. and a Howard Hughes Medical Institute investigator. Sawyers is also a winner of the esteemed 2009 Lasker-DeBakey Clinical Medical Research Award. Additionally, he is a professor in the Cell and Developmental Biology Program and the Department of Medicine at the Joan and Sanford Weill Graduate School of Medical Sciences of Cornell University, also in New York. Sawyers’ PCF-funded research in prostate cancer molecular pharmacology in 2009 defined up regulation of androgen receptor signaling as the primary mechanism of resistance to hormone therapy, resulting in the discovery of the anti-androgen MDV3100 that was recently shown to prolong survival in men with metastatic prostate cancer. Dr. Sawyers has been a recipient of PCF research award support since 1996. The Prostate Cancer Foundation and SU2C believe that this unique Dream Team model will advance scientific research in the interests of both today’s cancer patients and those who may develop cancer in the future. Prostate cancer, like other types of cancer, is not a homogeneous disease. For example, up to 50 percent of hormone refractory prostate cancer patients have a genetic aberration of two genes fused together. Often, these fusions involve the ETS genes, a group of oncogenes that play an important role in the progression of prostate cancer. A majority also have a “deletion” or loss of an entire gene called PTEN. The diversity of genetic aberrations found in prostate cancer suggests that treatment decisions will require a personalized or precision approach — matching treatment to specific characteristics of a tumor. The premise for this proposal is that information about the genetic makeup of an individual’s prostate cancer may guide the doctor to choose a “personalized” treatment for that patient. Chinnaiyan, Sawyers and the members of their Dream Team will focus on patients with metastatic prostate cancer. First, the team will implement a multi-institutional study that systematically evaluates patients enrolling in four clinical trials, evaluating novel drugs against the treatment of hormone refractory prostate cancer at five leading clinical centers. They will identify predictors of why some patients respond to these therapies, as well as predictors of resistance to these therapies. The study will capture a molecular snapshot of a patient’s cancer and incorporate this information into the clinical trials. It will also enable a framework that will facilitate progress toward a personalized approach for evaluating new drugs and treating patients with prostate cancer. The delivery of clinically valuable information based on the analyses of each patient’s tumor will improve the lives of patients with prostate cancer. While state-of-the-art technology in DNA sequencing has dramatically accelerated biomedical research, translation into a clinical setting has numerous barriers that limit the potential benefits. This multi-disciplinary, multi-institutional effort establishes a framework for translating research into precision prostate cancer medicine for patient care. The project is estimated to start mid-2012 with the first clinical trials scheduled to open in early 2013. A SU2C-PCF Joint Scientific Advisory Committee (JSAC) conducted a unique, rapid and rigorous evaluation of the applications via a multi-step scientific review process. The committee is chaired by Nobel Laureate Phillip A. Sharp, PhD, institute professor at the David H. Koch Institute for Integrative Cancer Research at the Massachusetts Institute of Technology in Cambridge, Mass. It is co-chaired by SU2C representative William G. Nelson, MD, PhD, the Marion I. Knott director and professor of oncology, and director of the Sidney Kimmel Comprehensive Cancer Center at Johns Hopkins University in Baltimore, Md., and PCF representative Howard R. Soule, PhD, executive vice president and chief science officer of the Prostate Cancer Foundation. The JSAC is comprised of highly accomplished senior laboratory researchers and physician-scientists, as well as advocates. The review process began with a call for letters of intent by the AACR in October. The committee then chose four finalist teams, each of which met with the JSAC to present the plans for their research and respond to questions about their projects – a level of interaction between applicants and reviewers that is unique in a scientific review process. • Philip W. Kantoff, MD, Dana-Farber Cancer Institute, Boston, Mass. • Levi A. Garraway, MD, PhD, Broad Institute, Cambridge, Mass. • Peter S. Nelson, MD, Fred Hutchinson Cancer Research Center/University of Washington, Seattle, Wash.
• Johann S. de Bono, MD, Institute for Cancer Research/Royal Marsden NHS Foundation Trust, London, U.K.
• Mark A. Rubin, MD, Weill Medical College of Cornell University, New York, N.Y.
• Doug Pergament, University of Michigan, Ann Arbor, Mich.
• James Kiefert, Fred Hutchinson Cancer Research Center, Seattle, Wash.
• Stan Klein, Dana-Farber Cancer Institute, Boston, Mass. • Thomas Farrington, Dana-Farber Cancer Institute/Broad Institute, Boston, Mass. • Ian Liston, Institute for Cancer Research/Royal Marsden NHS Foundation Trust, London, U.K.
• Grant Gregory, Memorial Sloan-Kettering Cancer Center, New York, N.Y. Prior to today’s announcement, SU2C has awarded grants to six Dream Teams and 26 Innovative Research Grants have been awarded to young investigators. These recipients comprise 270 scientists from 67 unique institutions. The Prostate Cancer Foundation (PCF) is the world’s leading philanthropic organization funding and accelerating research. Founded in 1993, PCF has generated more than $475 million and provided funding to over 1,600 research projects at nearly 200 institutions in 15 countries around the world. PCF advocates for greater awareness of prostate cancer and more efficient investment of governmental research funds supporting transformational cancer research. Our efforts have helped produce a 20-fold increase in government funding for prostate cancer. More information about PCF can be found at pcf.org. Stand Up To Cancer (SU2C) – a program of the Entertainment Industry Foundation (EIF), a 501(c) (3) charitable organization – raises funds to accelerate the pace of groundbreaking translational research that can get new therapies to patients quickly and save lives. SU2C facilitates collaboration among the best and the brightest in the cancer research community. The American Association for Cancer Research (AACR) and a Scientific Advisory Committee conduct rigorous, competitive review processes through which SU2C’s grantees are selected. By galvanizing the entertainment industry, SU2C generates awareness and builds grassroots support for this new approach to ending cancer. Stand Up To Cancer was founded by a group of media, entertainment and philanthropic leaders whose lives have been affected by cancer in significant ways. Members of SU2C’s Executive Leadership Council include Sherry Lansing, chairperson of the Entertainment Industry Foundation’s (EIF) Board of Directors and founder of the Sherry Lansing Foundation; EIF President and CEO Lisa Paulsen; Katie Couric; EIF Senior Vice President Kathleen Lobb; Rusty Robertson and Sue Schwartz of the Robertson Schwartz Agency; Pam Williams, partner at Laura Ziskin Productions; and nonprofit executive Ellen Ziffren. The late Laura Ziskin, a legendary film producer who executive produced the 2008 and 2010 SU2C telecasts, was also a co-founder of Stand Up To Cancer.